While Magaluf may have a reputation as the go-to location for a good time, there’s a darker side to the boozy holiday destination. Nothing demonstrates this more than brutal footage showing two men brawling in front of a braying crowd on the Majorcan resort’s notoriously sleazy strip, The Daily Mail reports. The two blokes, who are believed to be British, can be seen drunkenly throwing punches at each other as one of the spectators records the whole battle on his mobile phone. 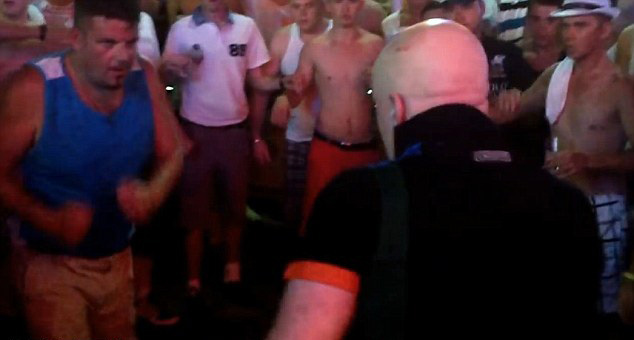 The savage footage shows a bald man circling his opponent, who’s wearing a blue top, before he lashes out delivering several quick punches that leave the man in the blue shirt with a bloodied face. The brawl lasts all of two minutes before the crowd finally pry apart the drunken men. Magaluf has got quite the reputation in the last few years due to the antics of Brits abroad who’ve gained the reputation, rightly or wrongly, as drunken troublemakers. Authorities have introduced £500 fines for tourists caught causing trouble, although we don’t know whether the two brawling men in the video were punished for their fight.